Thinking about studying abroad? UC Berkeley offers dozens of countries to travel to. Spain? Hong Kong? The possibilities are truly endless. We at the Clog want to give a little spotlight to Italy, though. Italy is hot, hot, hot (in summer, at least), both in terms of weather and tourist popularity. It just can’t be missed! Studying abroad is a chance to experience new places and cultures, so here’s the Clog’s two-week guide to having fun in Italy. Wow! Rome! Much history! Many ruins! Though Rome has its share of ruins such as the Colosseum, Roman Forum and Palatine Hill, the Pantheon, Trajan’s Forum and more, it also has many intact attractions. Spend the first day exploring the city and running into buildings such as the Palazzo Venezia and the headquarters for Il Tempo, as well as the French and Brazilian embassies around Piazza Navona. Then hit up all the ruins the next two days, and save the last day for staple sites such as the Trevi Fountain, the Roman Ghetto and Vatican City. The birth and the heart of the Renaissance lies in Florence, or Firenze. First things first — go to Gelateria Santa Trinita, arguably the best gelato place in all of Florence. Then go to the Palazzo Pitti and Boboli Gardens, which house a grand museum filled with the relics of the Medici family, former rulers of Florence. The Duomo is Florence’s main cathedral, inside which you can scale more than 400 steps to get to the top and see all of the city. Another place to get an amazing view is Piazzale Michelangelo, which is also a hilly trek. The views are great, but the sweat is not. Also check out the Palazzo Vecchio, which used to house the Medici family, and its “loggia,” or open-sided gallery, with some marvelous sculptures, as well as the Galleria dell’Accademia, where the famous David statue is housed. If you have extra time, take a half-day trip to Pisa and see the tower! A sinking city that can’t be renovated and is laced with canals is just as enticing as it sounds. Venice is a whole other experience. Visit St. Mark’s Square and St. Mark’s Basilica first and then the nearby Doge’s Palace, as this area is the place that will really introduce you to Venice. Afterward, cross the Grand Canal to San Giorgio’s campanile and climb up to see a great panorama of the city. We suggest taking one of the water taxis through the Grand Canal to see all the houses of royalty, cathedrals, cruise ships and the famous Rialto Bridge. Stop wherever you want and make sure to pick up a papier-mâché mask at some point! And, of course, you can’t leave the city without taking a ride in a gondola. You can see every detail of the elegant decay that Venice is going through — it’s wild. Oh, and don’t forget to try a Venetian Spritz cocktail. You’ll thank us later. Days 11 through 14: Naples, Amalfi and more! While the city of Naples isn’t as touristy as the other cities, it still has a culture of its own. Spend a day eating some of its well-known Neapolitan pizza while walking along the water. Otherwise, we’ll mainly focus on the surrounding attractions. Take two days to go down to the Amalfi Coast, the scenic beach cities built into the hills. 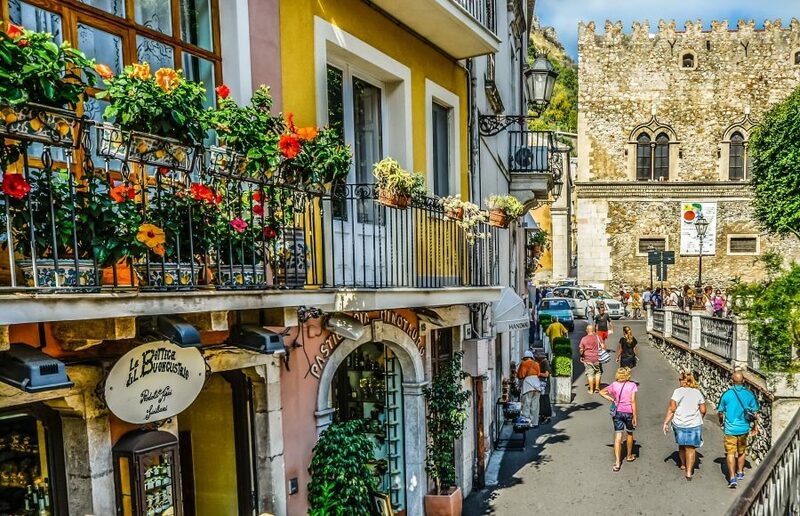 Hit up Salerno by train and take a ferry to Amalfi, Positano, Ravello and Sorrento (but don’t try to cram too much into a day — pace yourself). These cities are gorgeous and the ultimate Italian beach towns. Try some local seafood with Limoncello lemon liqueur — or basically anything lemon-flavored. The next day, head to Pompeii and Herculaneum, two cities destroyed by Mount Vesuvius but preserved enough to appreciate their Roman engineering. There are bodies encased in ash on display, which are pretty harrowing to see. That’s enough for one trip! Make another one to see Milan, Torino, Bologna and some of the other smaller but bustling cities that dot Italy. We could keep coming back here again and again and again.